Cumbria’s Police and Crime Commissioner Peter McCall has recently awarded just under £28,000 to local community groups from the Police and Crime Commissioner’s Property Fund. The Police and Crime Commissioner’s Property Fund was established to reinvest money seized under the Proceeds of Crime Act. Local community groups together with their Community Policing Teams are able to make applications for funding for grants up to £2,500, for projects or initiatives that will help tackle priorities within the Commissioner’s Police and Crime Plan. Peter McCall said: “ I am encouraged by the number of community groups, from right across the county, applying for funding in conjunction with their Community Policing Teams. There is a wide range of activities that will be supported, including projects aimed at developing community cohesion and raising awareness around equality and diversity, as well as supporting vulnerable people to feel part of the community. 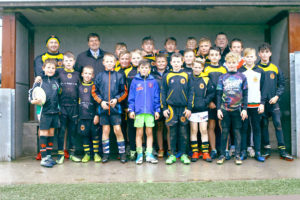 “There are also a number of sporting clubs that with this funding will be able to provide diversionary activities for young people aimed at reducing incidents of anti-social behaviour, as well as activities which provide positive opportunities for young people. “I plan to visit some of the groups in the forthcoming months to see how the funding has helped them achieve their objectives, and what difference it is making in their community.